After the Summer World Championships we can't stop ourselves, we get more impetus, and we continue our interviews. Today we asked a brand new biathlete. She just started her career with a perfect performance. Now, keep calm, and read our interview with the young Slovenian rocket Anja Eržen. BFH: Dear Anja, thank you to accept our interview request. 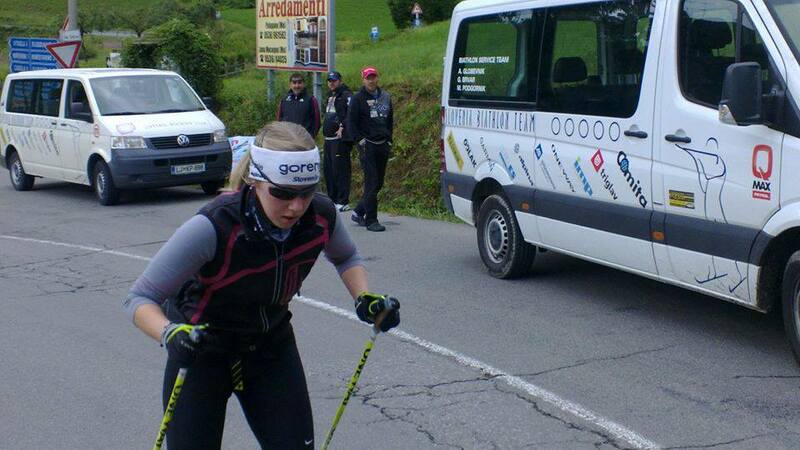 You are a new girl in biathlon, until this time you went skiing in cross country competitions. Please tell to us when did you start your career? Anja: My career started in 2002, we went cross-country skiing with our school and there I met a teacher, who was also a cross-country trainer in a club, to which I joined later. But the biggest influence on me had my uncle, who was a very successful biathlete, Janez Maric. My family, especially grandparents, always wanted me to become a biathlete, and at the beginning I was pretty sure myself I will become one, but then my path took the other direction, cross-country skiing. BFH: You have a lot of top 10 places and wins in your ages in cross country, but you choosed biathlon for the next season. Why? You aren't statisfied with your efforts, or you would like to looking for some new challenges? BFH: How do you feel yourself in the world of biathlon? What were your first feelings and what do you like in this sport? Anja: I absolutely love it! Biathletes are much more relaxed and communicative. I’ve met more biathletes from other countries in one week than I did cross-country skiers in 11 years. Everybody knows everybody and they are always so positive. And our team is so amazing. Even though there are not many girls, the boys are great and they are always up for some fun. Not to mention the trainers, I really trust in their training system and they are always willing to help and explain me new things. I also really like the shooting. My uncle made me a wooden part of the riffle, so it’s made by my measurements. I like the fact that the results depend not only on skiing but also on shooting. BFH: Now you have different trainings, because you had to learn shoot. Was it difficult or you could learn it easy? Anja: I think I learned it pretty fast, at least my shooting coach says so. Of course there is still a lot of work to be done, but I am very motivated and up for it. Especially I need to learn to be faster and catch the right rhythm. And of course the standing shooting still gives me some hard time, especially on races, but I will work on that too, I promise. BFH: You already started in a big competition, and you reached absolutely perfect results. You missed the podium place with only 3,5 seconds in the sprint and you came in the 7th position in the pursuit. How can you summarize your first Summer World Championships? Are you statisfied with yourself? Anja: I am pretty satisfied, especially with my running. I just graduated from gymnasium and because of all the studying I started training pretty late. The shooting was expected. In the sprint it was okay because there were only 2 shootings. If only I didn’t miss that 4 targets standing. The pursuit was hard for me because of more shooting but I am still very happy with my results. BFH: Sochi is coming, but you already have memories from Vancouver, you was only 17 years old. Could you tell to us what special feelings did you have during that Olympic Games? Anja: The Olympic Games in Vancouver were an amazing experience. I felt really lucky to be a part of it. The people were so friendly, you could fell the Olympic spirit. The intention of me participating was the relay. But unfortunately Petra Majdic got injured and we didn’t make the result, we wanted. But still, I had great two weeks in Canada and I will remember it forever. BFH: Vancouver is the past.. Now, let's talk about Sochi! You must prove in a new kind of sport. How do you see your chances to take part in the next Winter Olympic Games? Anja: Well, I am older now and I have a different view on such big competitions like Olympic Games. I want to participate but only if I know I can do a good result. I don’t think you can count on me in Sochi, but we’ll see. I really want to prove myself. I want to deserve it. BFH: In November you can start your first biathlon World Cup season. What are your goals for that season? Anja: First I will start IBU cups and then we’ll see how that goes. It’s too soon to talk about World Cup. My main goal for now is to improve shooting skills and then we’ll go from there. BFH: You are still very young. Only 20 years old. You are in the beginning of a beautiful career. What could be your main goal in your career? Have you ever thought about that? Anja: Of course I thought about that. My main goal is to be a successful biathlete and of course to win an Olympic medal. Doesn’t everybody want that? BFH: We and I think also the other fans would like to know more about you. Please tell to us something about your private life. What do you do between the seasons and trainings? Have you got hobbies? Have you special habits before the races? Anja: I like to travel. But in the last few years there weren’t many chances for that because I had to finish school. I hope there will be more in the future. I also like to bake. But I have to find some recipes for healthier treats, otherwise my teammates will get fat. And I love knitting. Right now I have a project to make the whole team the same caps in the same colour (Olympic colours of Slovenia). I’ve already started because I have to make like 20 caps by autumn. Before the race I only do one thing. Before I go to sleep, I go through the whole track in my mind. On the day of the competition I am focused on the warming-up. Nothing special, really. I try to be as relaxed as possible. BFH: We already bought our tickets to Hochfilzen, so you also can count on our cheers. Your team mates already felt in Nove Mesto how can we cheer to our favourites. Finally, what special messages do you have to the Hungarian Fans? Anja: First, I would like to thank for the support! I will do everything that’s in my power to be the best I can be. I am looking forward to hearing you during the competitions! And thank you for the interview, it was my pleasure. Thank you the interview, we wish a successful season to you!